Inderjit Singh Kainth, MD, is an Internist, Primary Care Physician and General Practitioner, and owner of Brunswick Internal Medicine Group PC, with locations in South Brunswick, Kendall Park and Metuchen, New Jersey. Dr. Kainth is affiliated with University of Medicine and Dentistry, Robert Wood University Hospital, Princeton University Hospital, Raritan Bay Medical Center and JFK Medical Center. Dr. Kainth has been named a 2017 Top Doctor in New Jersey. 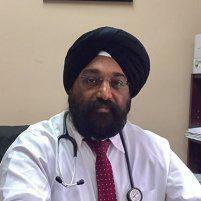 Dr. Inderjit Singh Kainth is a very experienced internist, who has been in practice for more than two decades. His career in medicine started in 1992 when he graduated from the University College of Medical Sciences, Delhi, India. After moving to the United States, he completed his internship at the University of Medicine and Dentistry of New Jersey's Robert Wood Johnson University Hospital, New Brunswick, New Jersey. He then completed residencies at Monmouth Medical Center in Long Branch, New Jersey, and at Thomas Jefferson University Hospital in Philadelphia, Pennsylvania. Dr. Kainth is certified by the American Board of Internal Medicine, and diagnoses and treats a diverse range of conditions for his patients of all ages. Conditions treated by him include Diabetes Mellitus, Hypertension, Cholesterol, Arthritis, Heart, Lung, Kidney, Intestinal, Urinary, Back pain, Osteoporosis, Obesity, Allergies and Skin conditions, STD Screening, and Psychiatric Conditions including Depression and Anxiety Disorders. He also provides a comprehensive range of medical examinations including Job and School Physicals, and administers vaccination including flu and pneumonia vaccinations. Dr. Kainth is renowned for his patient-centric approach to medicine, always taking his time to talk to patients about their conditions and possible treatments. This praiseworthy philosophy makes Dr. Inderjit Singh Kainth a very worthy winner of a 2017 Top Doctor Award.